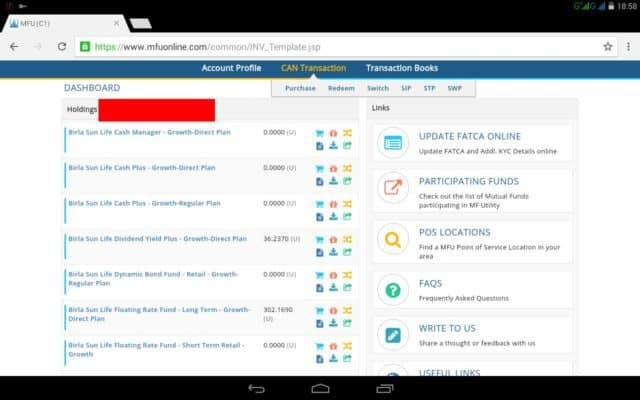 MF Utility is a mutual fund transaction portal jointly run by 25 AMCs. From today, 1st Jan 2016, investors can use its online transaction portal to invest in direct mutual funds. Instructions for how to go about this can be found here: MF Utility Online Platform is operational! 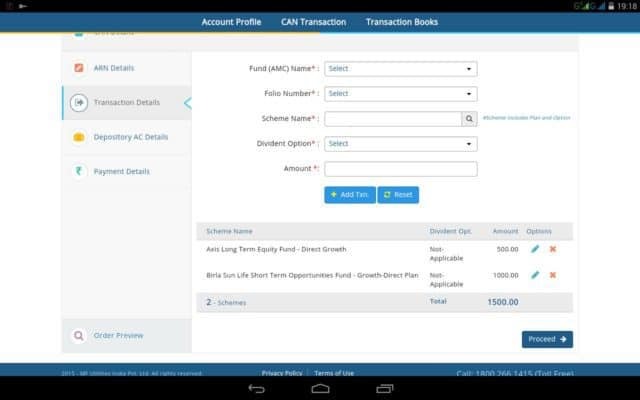 Here some screenshots of the transaction portal taken by Ravi Pathak. Ravi says, “main page includes zero balances mutual fund holdings as well”. So if you are an ‘experienced’ mutual fund investor, expect to see a lot of entries here! 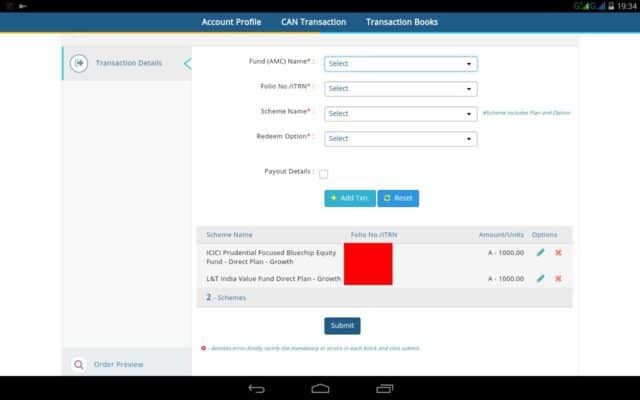 Ravi says, “After clicking proceed it ask for depositary details and if one wants fund in demat form, in payment page total of all transaction recorded is asked for payment. In image example Rs 1500 was final payment combined for both funds. Ravi says, “This is redemption page. Multiple redemptions allowed in 1 go just like purchase. Overall good feature which was missing in mycams or karvy”. Thank you very much for sharing this, Ravi. With MFU operational, and portals like Invezta, Unovest, Bharosaclub and Orowealth on the verge of opening, I believe 2016 is going to the year of the ‘direct mutual fund plan’. Note: All the missing posts have now been restored. Many images and download links in posts published before Aug 31st 2015 are still unavailable. They will be set right in the next couple of days. If you want any specific post immediately restored, please leave a comment. I have now got a cloud-based backup facility so that this kind of situation does not happen again. Thank you for your patience and understanding. Wish you all a happy and healthy 2016. Great news for DIY!! Already send email to MFU to get USER ID and Transaction password. They replied with assurance to revert back shortly. Hopeful for happy investing in 2016. “The existing CAN holders need to apply separately for online transactions. Likewise, all CAN holders for future CAN also need to separately send a written request for online access, if the customer so desires, since every CAN that will be opened will be in a physical mode by default. MFU will not market online transactions to customers. The request has to be initiated by the customer”, says V Ramesh, MD & CEO, MF Utility. He has made these comments at Economic Times. Clearly it shows that they are not interested in rolling out the online platform and it is he public pressure that is almost forcing them to do so. I am sure they will start to charge something for this within a year or so to make vele playing between regular and direct plans. Ansih it is now up and running. You should receive activation soon. The website performance on the UI leaves a lot to be desired. Clunky UI means navigting is not easy. All funds even with zero investment (which have been liquidated are still shown).Also UAT is not done properly hence payments could not be made. Also there is no dashboard, ability to fetch statements. This means you can use it only as a transaction portal and nothing beyond. It will be intersting to see how they develop this from a retail investors one stop shop point of interaction for MF investments. At present it is only an investing utility. It is just a day old. So I think we will have to wait and watch how it evolves. What is the specific reason to move from Direct Fund with AMC to CAN in MFU? One may hack AMC which may not reflect to other and can be saved from all amount lost. Also how many CAN we require if you are investing in Self name, Spose Name, Kids Name, Joint Name? Or just one CAN will represent all ? ha ha! I think each AMC will maintain separate records, so not too worried about that. Moving to MFU is a only choice. We will monitor future changes. Happy new year. yes let us hope it contnues to evolve. I have got the password etc, I made a transaction today through payezz , lets see how soon the money gets debited from my account. But its very good for transacting as I placed order for two separate funds houses schemes and paid at one go. Could you please let us know when did u apply for the access ? I am trying to see their turnaround time since it seems that is pretty long. One of my friend applied for a account by couriering the documents, and it was opened within 24 hours/same day, next day got the online password link also. But the I is not very good at present. It takes around 2-3 days. I sent the request mail on 6th jan, got acknowledge mail on 7th jan and login credentials today. Thank u very much sir for a good info. I have opened MFU account and purchased direct plans, also switched the existing regular to direct plan through MFU. Too many Advts in between the posts. Very difficult to read the post. Superb one. Can you let us know which portfolio tracker you use for investments in MFU online. They do not have a portfolio track feature in their website?